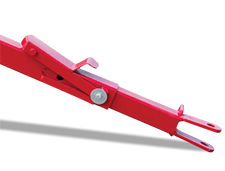 Take the precision work out of hooking up by freely moving the tongue into place and watch it lock into place as soon as it's in motion. 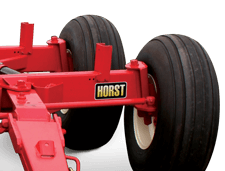 Roller bearings keep pivot points tight, ensuring no trailer sway and long-lasting use. 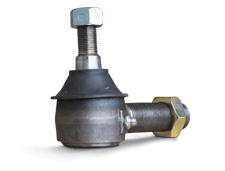 Automotive style ball joints not only keep our wagons behind you, they also provide years of hard working service. Ensures weight is evenly distributed on the back wheels across a variety of terrain. 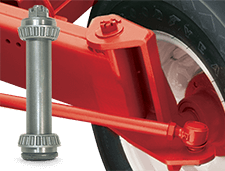 Triangulated for increased strength the tandem axle uses two mounts reducing flex under travel. 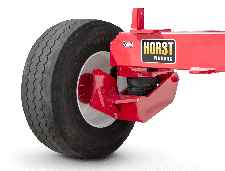 Our dual front axle set provides better weight distribution allowing easier steering and a smoother ride. 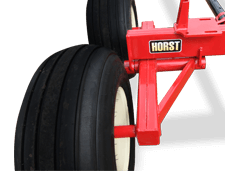 Road Flex suspension uses shock absorbing blocks to reduce the amount of bounce the wagon encounters as it's pulled down the road or across the field. Only available on Road Flex Running Gear models. 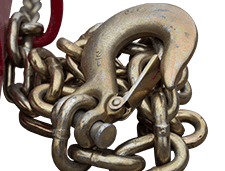 Our Grade 70 standard equipment safety chains in 3/8", 1/2" and 5/8" sizes make sure your wagon is secure.